One great resource for getting you started is the Portable Genealogist Problem Solving in Irish Research, written by Marie E. Daly (who herself is a valuable NEHGS resource for Irish research). Marie notes that “the prevalence of common surnames, the lack of a nationwide search capability, and faulty family tradition can make it difficult to discern your ancestor’s true origins and will give anyone a genealogical headache.” To help readers, the guide identifies common brick walls that you might encounter and helps you identify research strategies. For instance, a little checklist notes records for determining a more exact birthplace. 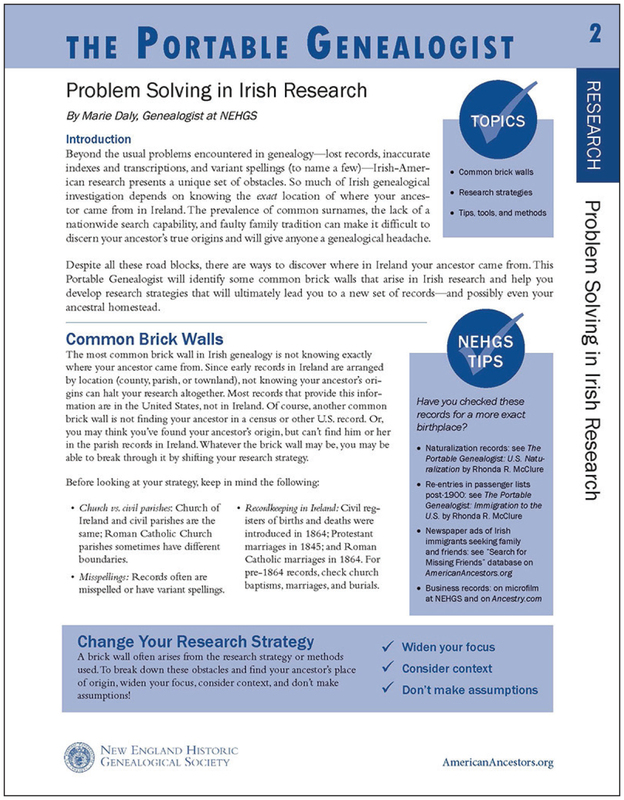 The guide also addresses some common assumptions that prevent researchers from moving forward with their Irish research. Marie is also behind the Irish Genealogy subject guide at Online Learning Center at AmericanAncestors.org. Here you’ll find information on where to find census records, census substitutes, church and vital records, and useful maps and atlases as well as links to other useful sources. 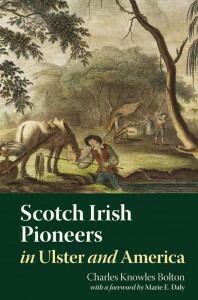 The subject guide another great starting point, but it will be helpful even if your Irish research is well underway. Beginning tomorrow, Marie will also be teaching the online course Irish Genealogical Research. Open to NEHGS members, the three-week course still has a few slots available. So don’t be discouraged — once you know where to look for your Irish ancestors, they won’t seem as elusive as that fabled pot o’ gold. Having come to a seeming brick wall in the research of my Irish ancestor, Patrick Googins, would you or someone at NEHGS be able to suggest how to proceed? The surname Googins seems to not exist in Ireland, my assumption is that it was probably Gookins, but I haven’t been able to find any information about where Patrick may have come from in Ireland or his parentage. He arrived around 1720 and seems to have worked as a woolen weaver in the mills of Sir William Pepperell in Pepperellborough, the Saco/Biddeford area of Maine. He was married to Mary Rogers, daughter of Richard and Eleanor (Moore) Rogers, Jr. and granddaughter of Thomas Rogers. He died, aged 65 in 1765. Members of the Googins, McFarland and Smith families of the Pepperellborough area were the first permanent settlers of Trenton, Maine and there is a stream here in Trenton/Lamoine named Kilkenny Stream, which could perhaps be a clue to where they were from in Ireland, but I have not been able to find a connection. Thank you. HI Martha, I suggest giving us a call at 1-888-296-3447 to ask about the options for getting assistance with your research. I’m new to blogs so forgive me if I have gone astray (and help me not to do so in the future) but I have an Irish puzzle. Patrick Carrigan married Margareth/Margaret Hunt about 1832 in the vicinity of Castleton, VT. An early record published in 2 places say that M and her sister, Hannah and father, Owen, had arrived in Castleton in 1830. No mention of a mother. No mention of what happened to Hannah (and I know nothing of her but the name), no mention of where in Ireland all these originated. Would love to know anything more about Patrick and Margareth prior to 1839. Their lives after that point are already known to me. Where might I find more about these folks? This would have been my mother’s one-hundredth birthday. At her parties, her aunt – who was among the first class of women graduates of the U. of Rochester, and as a Phi Beta Kappa – always reminded us that we were Orangemen! Covenanting Presbyterians who came to NY by 1805 and remained in that splinter church for more than 100 years. Very interesting people, very strong, one might even say rigid. A whole history unto themselves. According to a family history self-published by a relative in the 1980s, my McGrew grandmother was descended from “Ulstermen” ancestors who may have originally been Macgreggors. They were banned by the Crown in Scotland from using that name in the early 1600s for rampaging against their neighbors. Ultimately life got so hot for them there that they went to the north of Ireland. As staunch Presbyterians, life in Ireland wasn’t wonderful either, so they emigrated to either Pennsylvania or Tennessee ca. 1720. All this is rather vague, but the family is traceable in Tennessee by the late 1700s, thence to Indiana and Illinois, ultimately to Idaho and Washington State by 1900. This is a line I have done no further research on. Perhaps Bolton’s book might help, at least in setting the stage. The family book has no sources, though it’s clear the writer did a lot of research. I think that Bolton does a nice job of providing context–it’s one of those books I find myself reading through when I’m only supposed to be looking up a name . . .
My Irish ancestors were Thomas Wallace and Eliza Dougherty who lived in Rochester, New York. The census records constantly claimed that Wallace was born in Ireland and Dougherty in Canada of Irish parents. After I found the marriage of a daughter in a Rochester Presbyterian Church my entire thought process changed. I had been looking in Catholic cemeteries for the Wallace family but of course my Ulsterman was not located there! My mother always used to say we were supposed to wear orange on St. Patrick’s Day but as a child that seemed ridiculous to me. I have gathered a great deal of information on these people, even their 1856 marriage record from Cobourg, Ontario, Canada. Next I found the family in Westchester, NY in 1860, then they moved to Rochester. I cannot find a route that leads me back to Ireland. Every St. Patrick’s day I drag out my records and try again to find a little crack in my Irish brick wall. Ellen Butler, supposedly from Limerick, father Thomas, born in the 1820’s and supposedly went to Boston to a “relative” General Benjamin Butler. You would think with a famous relative, I could find her. No. She married Thomas Willmore in Boston-Philadelphia-somewhere- in the 1840’s. Can’t prove her on a boat among a slew of Ellen Butlers. Can’t find the marriage. No baptism in Ireland. Nothing. Finally found the baptism of their first child in PA — and Ellen got baptized at the same time. I have been teetering on square one for 30 years. Looks like I should just glue myself to that edge.